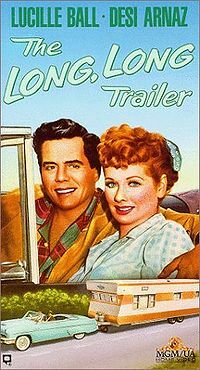 In 1954 Vincent Minelli directed the farcial comedy, “The Long, Long Trailer”, starring a 1953 Mercury Montclair convertible, a 1953 New Moon trailer, and the two most popular television stars of the day, Lucille Ball and Desi Arnaz A modest budget movie, it became the cult classic for aluminum. If you have spent longer than two weeks, with a loved one, confined in a metal tube, the parallels are unmistakable. The film (not the coating on one’s teeth) is replayed often on classic TV channels. The real star, the New Moon trailer, I have uncovered in the remote wilderness of Michigan’s eastern upper peninsula. It resides quietly uninhabitated, adjacent to the DeTour Village museum, a stone’s throw from the Drummond Island ferry dock, and overlooks the scenic St. Mary’s River passageway.The river hosts nearly constant freighter traffic to and from Lake Superior, joining the other four great lakes, & beyond. Here, the oxidized corrugated aluminum siding of the New Moon, skirted with a weathered thong of cedar decking, ignores the background passing of a U.S. Coast Guard patrol ship. Now in its mid-50s, nearing retirement, the memory of crossing the Sierra Madre with Desi at the wheel will have to endure for the old tin can. At least until eligibility in medicare part A and part B kick in.